Urbanscapes showcase New York City as a “landscape”. I attempt this by marrying natural aspects of the past with present day and future imagery. 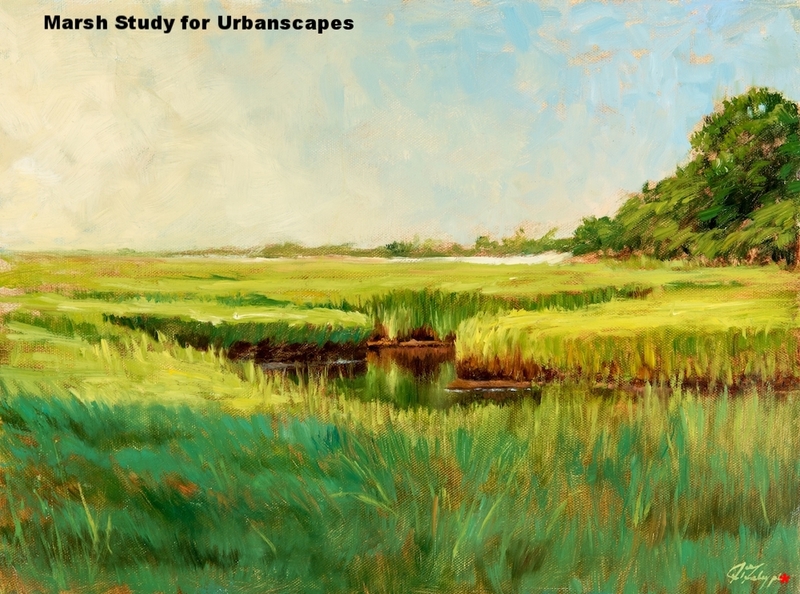 For example; marsh grasses superimposed over parking lots and green roofs adorning present day infrastructure. Also, by using a panoramic format, a blue and green palette, and largely depicting sky and water I offer a wider and more natural perspective on a cityscape that is more typically defined by its streets, architecture, and people. It's easy to forget there's a landscape beneath the concrete and that many species of plants and animals inhabit our parks, waters, and skies. By highlighting the landscape I hope this series will remind us of the former and existing New York City landscape while promoting the concept of "re-greening" cities to come. With urban sprawl a likely reality of the future it seems crucial to incorporate greater swaths of nature into the built environment for the health and well being of the community. This in-process series evolved during a residency at Brooklyn Art Space with Christina Kelly in 2015 and was originally inspired by several sources including; the Gowanus Canal Conservancy, specifically their large scale public banner project, Making Gowanus by, Andrea Parker, Alexia Donati, Julia Price, and Gina Wirth. I was also greatly inspired by Eric Sanderson’s Mannahatta, both his writing and Markley Boyer’s illustrations allowed me to envision the New York City landscape as unspoiled land abounding with a diverse array of plant and animal species. Eymund Diegel, map maker extraordinaire, helped flesh out how the Gowanus landscape and how its shorelines looked “pre-concrete”. Also inspired by urban naturalist, Gabriel Willow who educates about plant and animal species in and around New York City. The panoramas (18" x 36") fit together as triptychs (18" x 108") joined together they make up the length of the Gowanus Canal.